Background: Totally laparoscopic right hemicolectomy with intracorporeal anastomosis has recently been described. The purpose of this study was to assess the advantages of this technique in comparison with laparoscopic assisted and open surgery. Methods: We retrospectively analyzed all patients who went through elective right hemicolectomy in our department between 2007-2010. 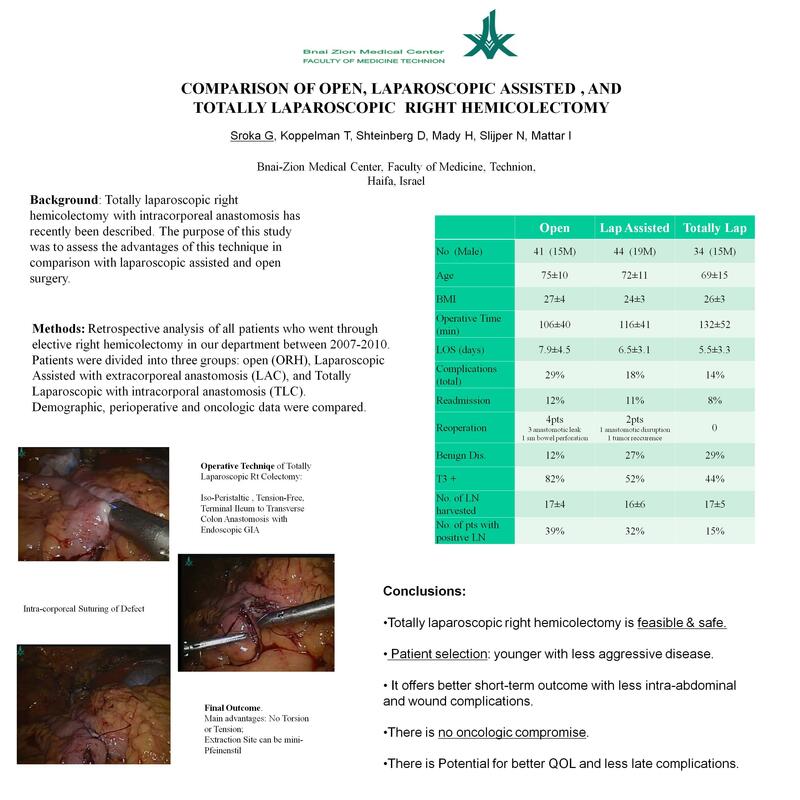 Patients were divided into three groups: open (ORH), laparoscopic Assisted with extracorporeal anastomosis (LAC), and totally laparoscopic with intracorporal anastomosis (TLC). Demographic, perioperative and oncologic data were compared. Results: 119 patients who were operated. 41 underwent ORH (15 male), 44 underwent LAC (19 male) and 34 underwent TLC (15 male). Age and BMI were the same. Average length of stay was 6±2 days for TLC, 7±3 for LAC and 9±3 for ORH. Operative duration was 136min in TLC, 115min in LAC and 105min in ORH. 5 patients (14%) had minor complications in TLC, LAC had 8 (18%) post operative complications out of which 3 were intra-abdominal collections, and ORH had 12 complications (29%), 5 of which were anastomosis related. Tumors tend to be more advanced in the ORH. There was no difference in number of lymph nodes harvested in the three groups. There were 8 incisional hernias in the LAC and not even one in TLC. Conclusions: Totally laparoscopic right hemicolectomy offers better short-term outcome with less intra-abdominal and wound complications and with no oncologic compromise.